A handmade wood wedding band inlaid with flame box elder burl accented with a thin 14k yellow gold pinstripe. 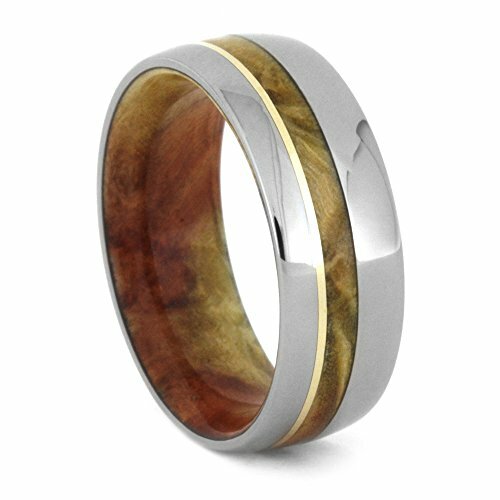 This titanium ring also has a comfortable wooden sleeve made with the same wood as the inlay. Optimistic and positive, gold adds richness and warmth to everything with which it is associated; it represents perfection in all things. This is proudly made in America with a green process of ethically, environmentally and socially responsible production processes of water, waste and energy management; this is from 100 percent recycled Karats. Choosing the right size for your custom ring is as important as the style. Titanium cannot be re-sized and the wood inlay goes all the way around the band with no joints. Part of the customization process for you is a purr-fect fit. Upon ordering your ring, a sizing ring is crafted for you in the width and size of the ring you ordered. It ships in 3 to 10 business days. Once you verify the size is exactly how you like it; the crafting of your hand-made ring is started.